GET rid of the VAR before someone gets hurt or keep it because it’s keeping players honest. That was the crux of a heated debate as the VAR got controversially involved at Hindmarsh on Sunday night. Adelaide in the end beat Western Sydney 2-0 to earn its first home win of the season and a top four berth. Ryan Kitto bagged a brace — a goal in each half - with his second dousing any chance Wanderers had of making a comeback. Kitto placed ball into a empty net after Nikola Mileusnic won a foot race with Michael Thwaite after a lucky deflection in the 63rd minute. 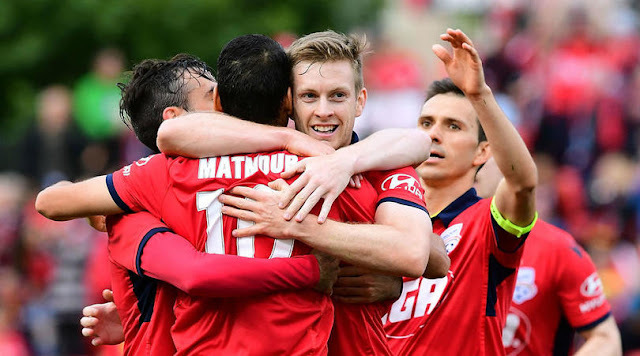 But United rebounded from the heartbreak of an extra-time FFA Cup final 2-1 loss to Sydney FC five days earlier to upset Josep Gombau’s ‘project’ which went pear-shaped in the 22nd minute when the visitors were reduced to 10 men. Ben Garuccio squared the players’ ledger to 10 each in the 76th minute when he was first given a yellow card for a challenge on Roly Bonevacia before VAR convinced pitchside official Chris Beath to take another look at the challenge before brandishing a red. The new technology held up play three times after video assistant referee Craig Zetter alerted Beath of obvious errors. The first call appeared correct when former Reds defender and Wanderers captain Robert Cornthwaite was booked in the 19th minute for handling the ball when Baba Diawara’s shot on target hit his outstretched arm inside the box. Cornthwaite was furious when Beath issued the caution then pulled out the red card after the defender just four minutes earlier was booked for charging into Kitto. Four minutes after the Cornthwaite handball Baba’s spot kick cannoned off the upright before the defender had an early shower. A minute into stoppage time the VAR held up play again after Kitto scored the opening goal and his third of the season with the outside of his foot, 21 minutes after his header smacked the upright from a Karim Matmour assist. The theory was that Baba who wasn’t involved in play was off-side as Matmour’s cross deflected off the head of Mileusnic to Kitto. Kitto was clearly onside but there was a lot of anxious faces in the Reds camp before Beath pointed to the centre circle to award the first goal. But it was a laborious Reds victory given United had perfect first half chances — Mileusnic had two close range misses and Kitto watched his effort in the 44th minute cannon off the legs of Vedran Janjetovic. But Ryan Strain — a former Aston Villa youth player — made a cracking debut for United at right back in place of the suspended Michael Marrone in a selection which surprised many except coach Marco Kurz before kick off. The 20-year-old was announced as a Reds scholarship player in September after playing 22 matches for United’s NPL side this year. And he wasn’t out of place getting a good early touch and winning his first battle with Japanese winger Jumpei Kusukame inside two minutes and firing in a brilliant cross in the fourth minute which jut evaded the head of Kitto. He ended a great shift in the 59th minute for Mark Ochieng. Just seconds later Oriol Riera’s header crashed against cross bar from a Raul Llorente cross.